Background and Objectives: Common variable immunodeficiency (CVID) is the most important primary disorder that is associated with clinical complications including recurrent infections, malignancy and autoimmune diseases. The genetic cause of CVID is mostly unknown and only a few genetic causes are identified. The various options are proposed for determining the etiology of CVID patients, such as T- and B-cell defects, Toll-like receptors (TLRs) impairments, altered cytokine production as well as blemished dendritic cells (DCs). The patients with CVID show a reduction in number and frequency of DCs in blood, an altered expression of cell surface molecules, and defective activation through toll-like receptors (TLRs). 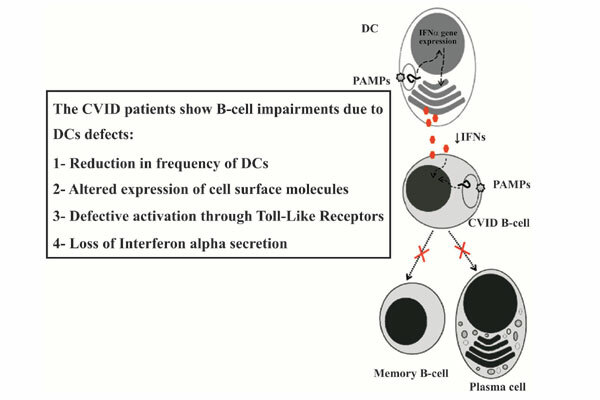 Also loss of IFNα has a critical role in B-cell impairments of CVID patients. The aim of this review is to collect under one umbrella, all the recent knowledge about DCs defects of CVID patients. Methods: This review covers basic information about physiology of DCs followed by reports of DCs situation in CVID. Conclusion: According to the results of researches assessing DCs frequency and function in CVID, the roll of DCs in the pathogenesis of CVID cannot be ruled out. The article is expected to encourage the researchers to do comprehensive researches about complex connections between DCs and other immune cells in CVID. Keywords: Common variable immunodeficiency, dendritic cells, B-cell, T-cell, toll-like receptors, cytokines. Keywords:Common variable immunodeficiency, dendritic cells, B-cell, T-cell, toll-like receptors, cytokines. Abstract:Background and Objectives: Common variable immunodeficiency (CVID) is the most important primary disorder that is associated with clinical complications including recurrent infections, malignancy and autoimmune diseases. The genetic cause of CVID is mostly unknown and only a few genetic causes are identified. The various options are proposed for determining the etiology of CVID patients, such as T- and B-cell defects, Toll-like receptors (TLRs) impairments, altered cytokine production as well as blemished dendritic cells (DCs). The patients with CVID show a reduction in number and frequency of DCs in blood, an altered expression of cell surface molecules, and defective activation through toll-like receptors (TLRs). Also loss of IFNα has a critical role in B-cell impairments of CVID patients. The aim of this review is to collect under one umbrella, all the recent knowledge about DCs defects of CVID patients.